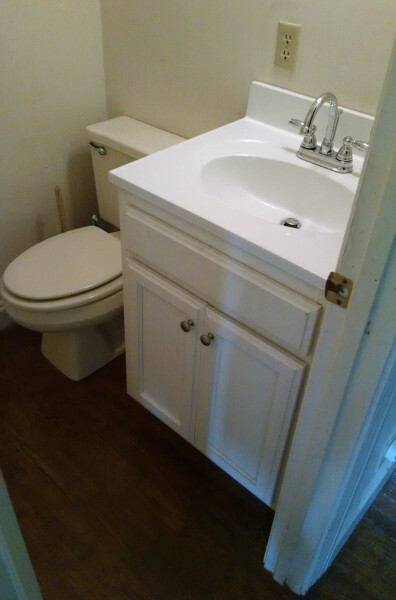 One thing I accomplished this year on the house was replacin the horrid bronze sink in our downstairs half-bath with one that doens't require polishing. Bronze is fine--if you have servants who can polish it every day. Otherwise it's green and yucky all the time. 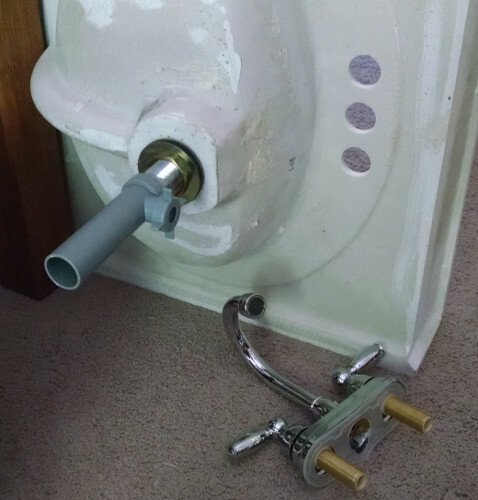 So my mother-in-law and my wife bought a new sink with a new pedestal at the end of the summer when we were back in town. 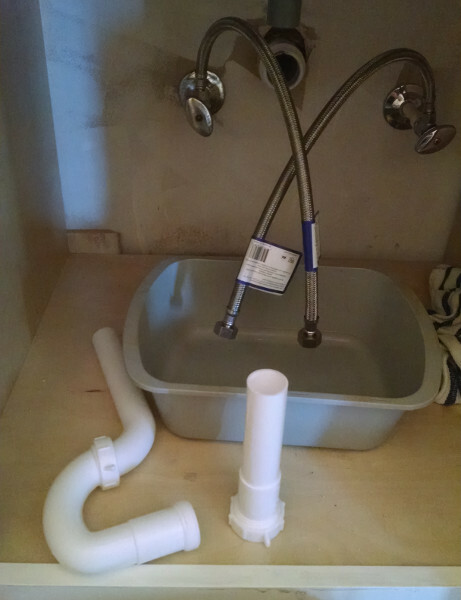 I took a lot of a weekend later in the fall and installed the sink in the half bath. 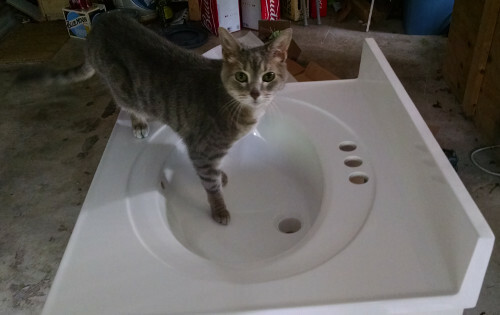 Here's Pangur inspecting the sink in the garage. The faucet that my son picked out for the sink. I was thinking a metallic bronze faucet, but he like the shiny one. Here I'm checking to make sure that the hoses I got are the right ones. 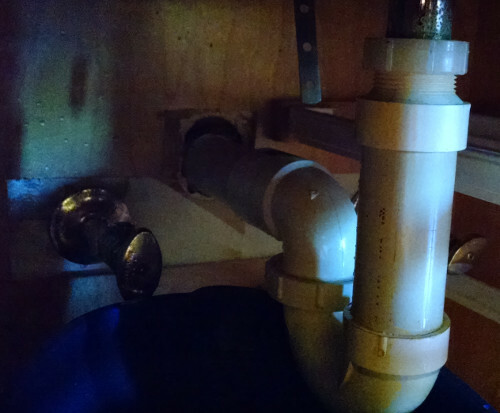 The under-sink drain attachments that we're going to have to transfer over to the new sink. 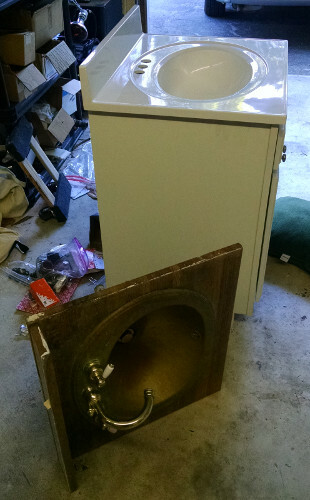 The new sink on its pedestal, with the old sink basin sitting next to it. 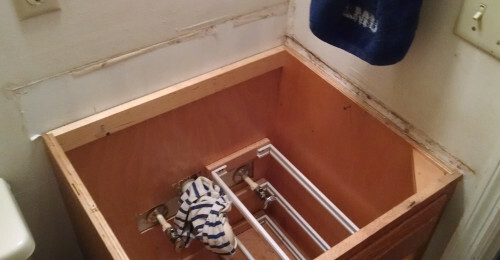 Old sink cabinet, with the basin removed, trying to get the cabinet out. 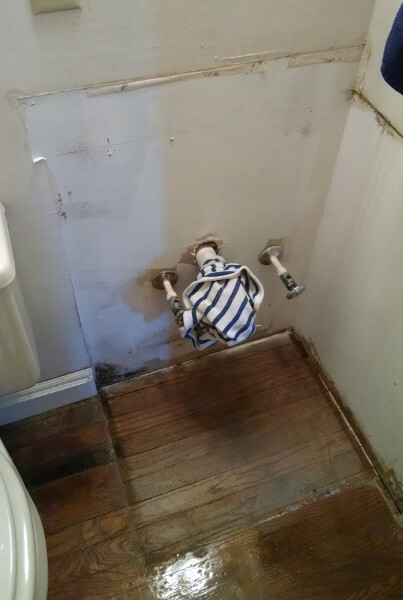 Getting the new cabinet into the bathroom was a near thing. 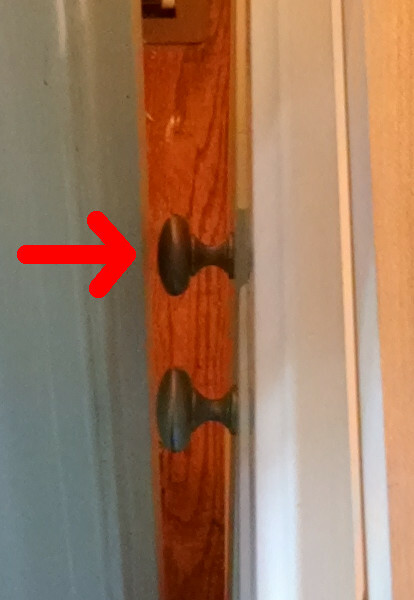 It had this much room to get past the door frame (that's with the door removed from the hinges). New cabinet in, getting the plumbing hooked up. 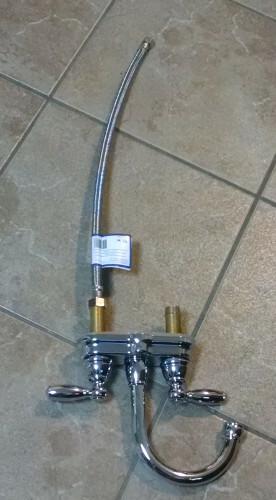 Getting the drain components set up and set for length. Sink pieces in living room getting all the pieces put together. 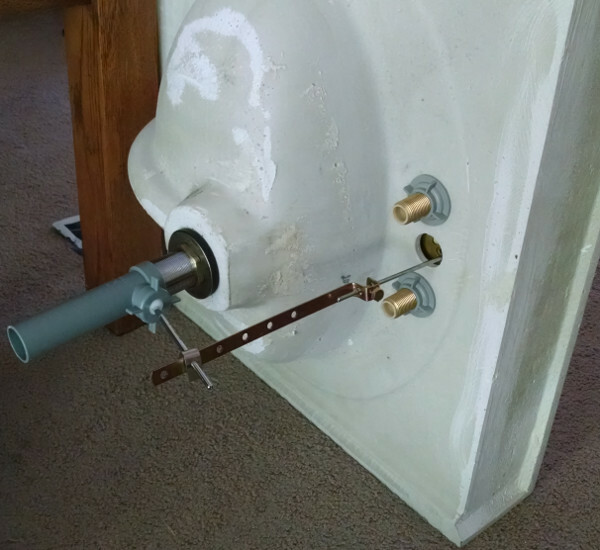 Drain stopper control hooked up. 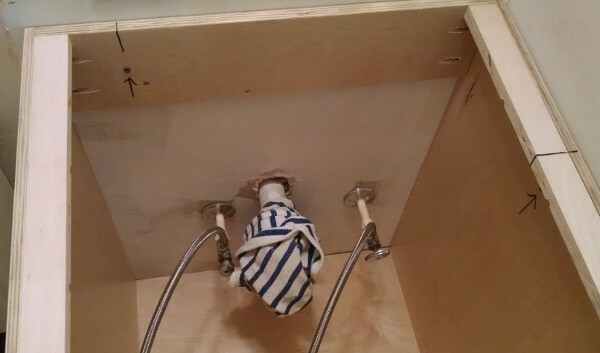 The sink has a built-in edge that overlaps the counter all around. 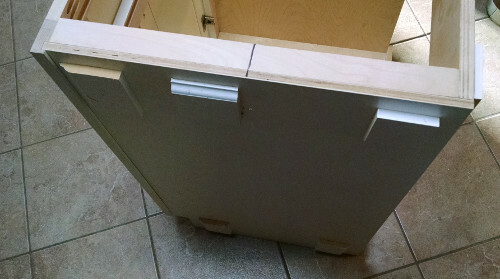 I realized that if I put the cabinet right up against the wall, the sink won't fit down in it. 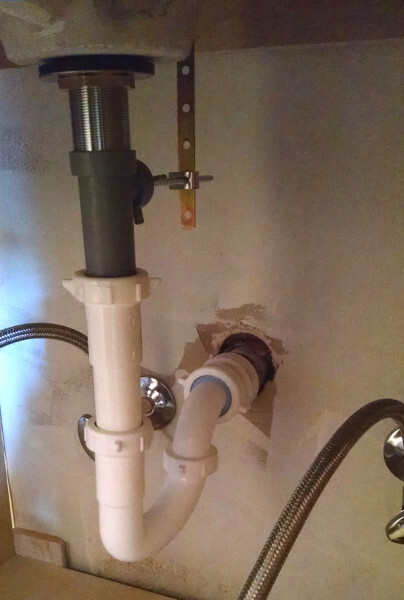 I had to put 1/2-inch spacers on the back and side walls to move the cabinet out from the walls so that the sink would fit. Here I'm nailing/gluing the spacers to the side of the cabinet. 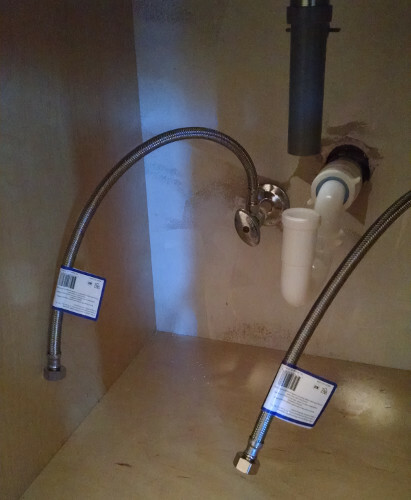 Sink in, ready to connect all the plumbing. Drain plumbing all connected. Everything fits! All finished! We have a nice, new, shiny sink in the half-bath. Huzzah! Capital improvements FTW!